This is one designer I can honestly say I fell in love at first sight with. Back in 2008, during a stint interning for London fashion PR RelativeMO, I was lucky enough to witness the birth of this designer's career at her Central Saint Martins MA Graduate Show. Three years on and she's still going strong. Ladies and gentlemen: Mary Katrantzou. Having just spent almost two months bombarded by traditional, oriental Chinese printed silks, my desire for some kind of modern, fashionable alternative was making itself quite apparent. Luckily Mary came to the rescue, with images of her AW 2011 collection being plastered around the web. As you can probably imagine, by the nature and content of this blog, I would give my right arm to get hold of one of these supremely ornate, digitally printed beauties. Anyone want to lend me 1.5 grand? Love the Mary Katrantziu clothing so bright, imaginative and very desirable.The Pinboards are brilliant. The way you lay out your blog, covering all aspects of culture and ethical fashion - have you ever thought about writing for a magazine? 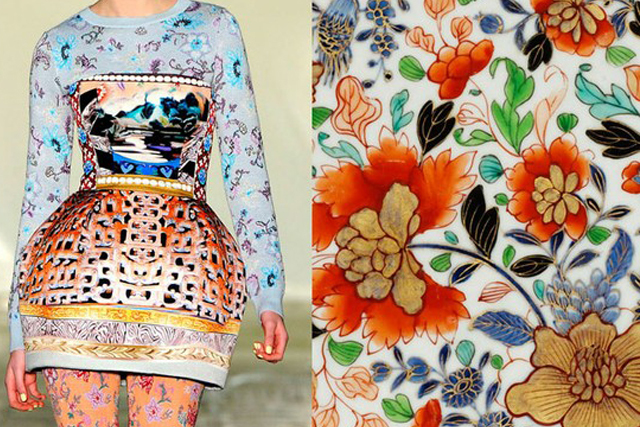 i am insanely obsessed with Mary Katrantzou - it's insane! i would wear these prints head to toe! I know right?! I love the modern twist, the silhouettes and the cuts. More like art than fashion but I'd gladly wear every piece of the collection! Anonymous - thanks for you're comment, very much appreciated! I actually used to work as an Editorial Assistant for Sublime magazine and still contribute occasionally - check them out www.sublimemagazine.com! what are you wondering about these wandering threads? © Wandering-Threads.com 2012. Powered by Blogger.